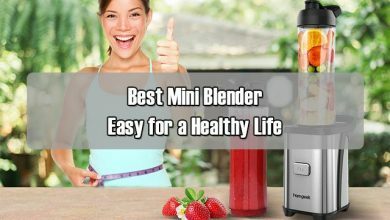 Feeling bored of too much dirt and mud on the surface of your potatoes, carrots and other kinds of foods? Scared of the strange things attached to them? In this case, you should own yourself a new and perfect veggies brush or cloth to get rid of all unwanted things out of your foods. However, you don’t know whether to use a dish brush, or which because almost every brush is so similar to one another. Therefore, I write this review for your better understanding relating to excellent vegetable brushes lasting long that you can choose for your daily chores after having conducted some researches. And I want to share it to you, and altogether you can choose the best for you. So here is my recommendation. Let’s begin! The first recommendation from me is this OXO Good Grips Vegetable Brush whose outlook is somehow comparable to a clothes brush. The product comes with two selections of colors, including light green and traditional black which gives you the right feelings of prepping your veggies. As you may imagine, the design of this tool is rather simple, which is measured at 4.9” x 3.4” x 2.4”, fitting greatly almost every size of hands. So, you don’t need to worry whether your hand is too small or too big to use the brush. Its bristles are all made of safe nylon which is especially firm and stiff and easy to take off dirt and grime stuck in your potatoes or carrots, even tomatoes without damaging them. These bristles pin into a plastic grib which is perfectly trouble-free to handle with. 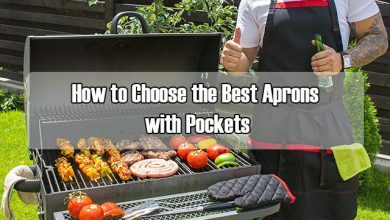 Besides, it is quite lightweight thanks to its made-of materials, therefore, you will find scrubbing the veggies not hard and tricky any longer. Instead, you only have to hold it tight in your hand and use a little force to clean your potatoes. However, one big problem of this is that due to the non-edge design, it is really difficult to hold while it is wet and the result is sometimes it flies off the sink. But you can reduce the case by letting it on a small basket when not used. Almost every brush can be put into the dishwasher and this OXO is not an exception. Plus, you can get a second one and put it outside the house for cleaning your muddy shoes and boots. 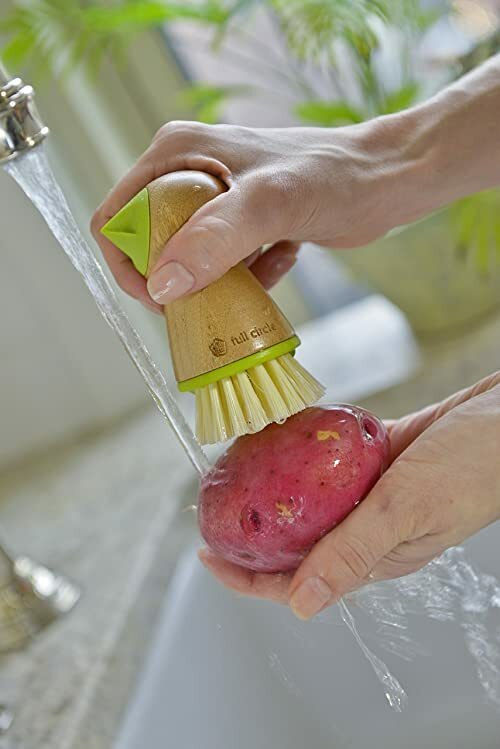 Well, this potato scrubber is so convenient, isn’t it? Next, we come to a quite similar but more advanced. That is the Full Circle Tater Mate Bamboo Potato Brush with Eye Remover that can take out the annoying potatoes’ eyes. What makes me really amazed about this product is its material: bamboo which is natural and totally safe to your health and your vegetables. The whole body is divided into two parts which has bristles at one end and a plastic remover for the other. You can choose between the green and white remover for your interest. The bristles are made of tough plastic for better veggies cleaning and these are kept to be quite close to each other, therefore it will remove more dirt or grime than the looser one but still keep your potatoes intact. One outstanding point of this tool is its potato’s eye remover which satisfies a great number of users practicing it. It is an acute plastic point attached into the body through a spherical bamboo shape. Thanks to the BPA free plastic material, you can take off all irritating eyes economically without using your bare fingers, which can lead to finger sore. The handle for this tool is so fit with your hands that you can reduce your efforts putting into this job. However, the size is sometimes considered to be small to some people, leading to some inconveniences. Compared to the other potato brushes, this is still much better choice for your brushing combo, together with the organic cotton cloth and the dish brush, they will be the most ideal set for your cooking chores. If you would like your scrubbing brush to be much cuter and more appealing for your interest so that you can do the work easier? Yes? 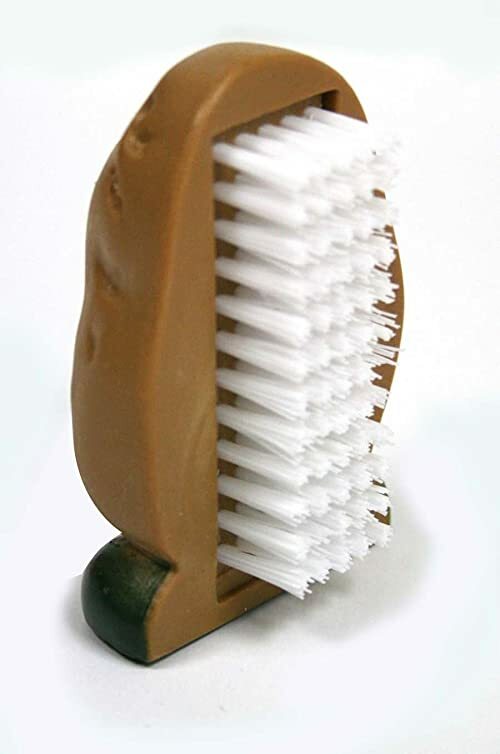 That’s why I’m going to show you this Joie Spud Dude Potato Vegetable Scrub Cleaner Brush. Actually, every brush has quite the same outlook, consisting a plastic body with many nylon bristles for cleaning the vegetables. What makes this Joie Spud Dude differ from others brushes is the design of the grib one which is not only eye-catching but also comes over the negative point of others. So, talk about the grib, you will be really surprised at how the brush is decorated. A funny cartoon potato with two eyes, two legs, one mouth and many potato eyes on it. Wow, such an adorable design, isn’t it? Just working with this one and it will totally make your day and cheer up your boring prep job. Besides, thanks to the addition of the legs which are flat at the bottom, the product can stand easily without flying out the sink like the above one. This tool can be used for cleaning potatoes, carrots, yams, apples, and so on without reducing the vitamins and minerals of the veggies. Thanks to the special design, this requires less effort of you to scrub, instead, just use a little power to take the contaminants, the dirt away from your foods. The product is a durable and reusable potato brush because it can last and be used for long time. Preserving the one is also easy because it can be washed by the dishwasher. Although some users may feel that the size is quite small compared with their hands, thus they cannot work with it as efficiently as normal, it’s suitable for almost a majority of people so that you don’t need to worry. This is a sophisticated version of the usual brusher because beside the tough bristles, there is one new detail attached into it which can make you become more comfortable while using. The mentioned feature is the rubber finger grip which you can put your finger into and this will perfectly keep into your hand, therefore you don’t need to worry about dropping or losing the tool while using. Besides, thanks to the design, you have to use your palm to clean the veggies instead of holding the brush by the hand, reducing your force on this a lot. Also, your hands will not be callous. 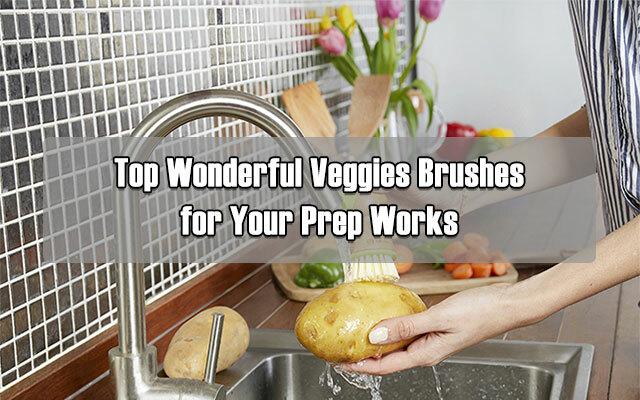 Plus, the bristles are wholly made of nylon which are really firm and tough, cleaning up to every cuts and corners of the vegetables, taking out even the hardest dirt and stains on them. Thanks to this tool, you can wash up to 1 or even 2 big boxes of potatoes or apples every day without annoying and boring. The Chef’s PalmBrush comes with 3 options for colors: green, red and purple, suiting with all kinds of counter and kitchen. But one problem is that the finger grib is too small for those who owns big hands and fingers, so the case may be difficult to use sometimes. 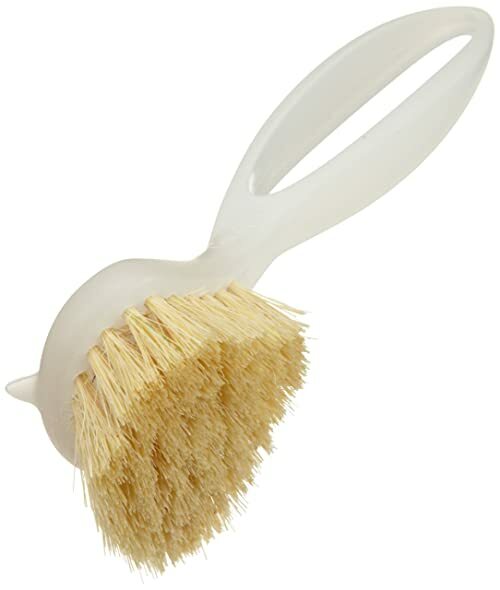 This one of the most affordable tool in this list is Casabella Loop Vegetable Brush. 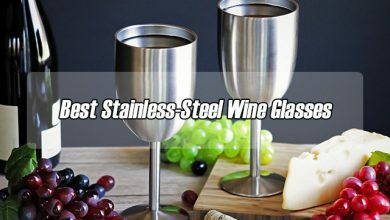 With the length of 6 inch, this can cater all tastes from the easiest to the hardest because everybody all seems to be in love with holding the handle rather than the grib itself. Similar to other brushes, the bristles are tough but suitable for cleaning without any damaging for the produce. You can freely wash the potatoes under water tap and using this to clean them. Apart from the normal usage, you can use this for other purposes such as washing the pan, dishes, muddy shoes, and so on. I have to say this is such a wonderful potato brush compared with its price. Overall, this is such a great gift for your kitchen. 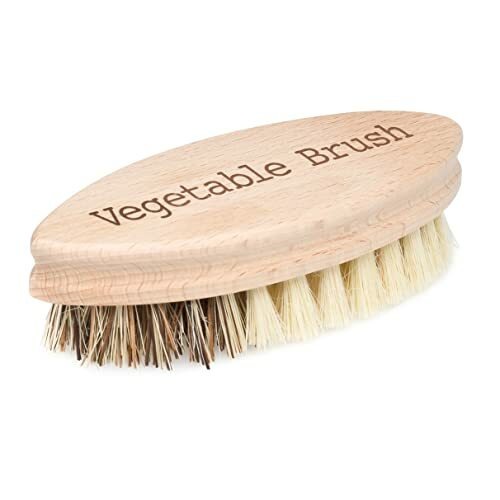 This list wouldn’t be complete without mentioning this Redecker Hard and Soft Side Vegetable Brush. This is a durability and long-lasting brush whose grib is made of beechwood, one of the best quality wood for making cooking utensils. Not to mention the appropriate size of the tool, this certainly eases your cooking daily chores a lot by reducing your forces and it’s not going to leave callous thing on your hands. One extraordinary of this product is that it has two kinds of bristles at the two ends of it. One very tough nylon for hard root crops and one soft for delicate veggies. That’s so convenient and “two birds with one stone” because you can use this for both kinds of vegetables, so you don’t need to buy another one for the other purpose. Measured at 5.3” x 2” x 1.5”, this is a suitable size for working with such a wooden brush. Besides, being made of wood means less chance for slip while the counter is wet. After using, you should shake the tool so that the extra water can come out of this in order for longer maintenance. Overall, this is really ideal brush for your everyday prep job. Just imagine how many potatoes, carrots, radishes, auberges, that you can clean, and how much time you can save. That is not to say the happy feeling that it gives you. What are you waiting for? Another wooden brush coming from Redecker brand is this Redecker Natural Pig Bristle Mushroom Brush with Handle. 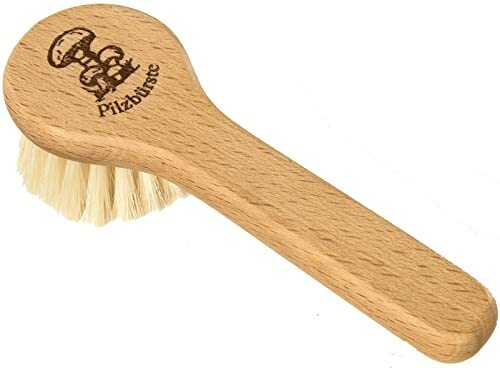 Unlike other mentioned brushes, this has the safe nylon bristles to gather into a circular wooden shape attached to the whole body so that the cleaning ability can be focused and it will become more efficient. This handy mushroom brush has the length of 5” which probably fits with your hands easily so that you can work with it for a long time. Besides, it is designed to clean the mushroom without using water because they should not be washed with water by which can reduce the minerals and the nutrients. Some people once used this are very satisfied with it now that it can take away all the unwanted things on the surface of the mushroom such as dirt, bark and insects, in the meantime, it can still keep the surface remaining unchanged, beautifully looked. Washing this mushroom brush is not demanding at all. 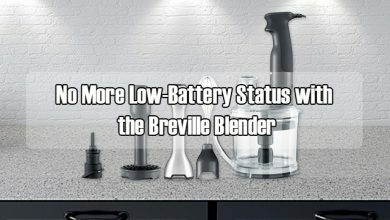 All you need to do is wash it by the dishwasher or under water tap after every time you use. Besides, you can make a small hole at the end of the handle and tie a small rope for hanging the tool on a shelf for the next time you use. 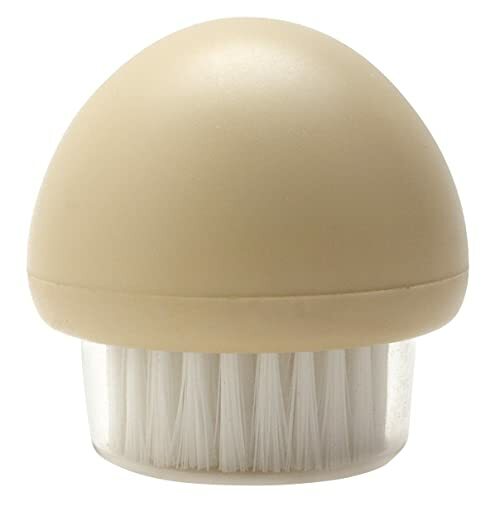 This is another mushroom brush that you can take into account whenever you want to purchase one. That is this Joie Mushroom Brush and Vegetable Scrubber. The outlook of this turns your thinking to the real mushroom because the grib has the shape of a white mushroom’s cap. So interesting, isn’t it? Actually, holding this cap is so calm and comfortable that you cannot feel any difficulties or annoyance while using. This is also followed by a plastic cap for easy storage, make sure you recap after using for longer maintenance. This is one of the smallest brushing tools for your prep works. However, brushing the mushroom won’t need to be so large so it’s somehow alright. But one thing you should remember is that you shouldn’t use this whenever there is water on it because this is recommended to be used when it’s so dry. Therefore, you shouldn’t wash it too often. 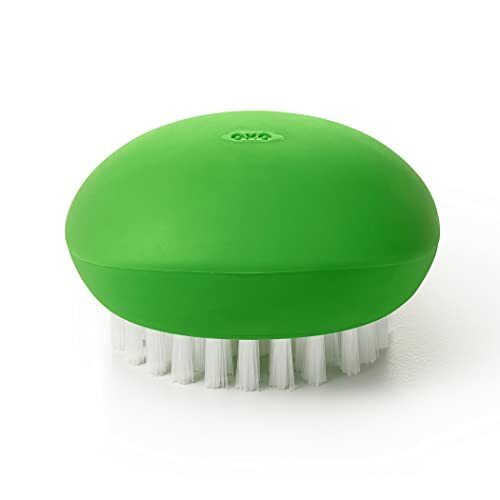 Of course, you can buy the second mushroom brush for cleaning your veggies but it will be a waste of money due to the small size. Therefore, just use the one for the right purpose of them. Imagine how the great smell and taste of such a non-dirt and non-stains on the mushroom that you eat will influence your state of mind: cheer up your mood, make your day, Overall, this is a great tool for removing unwanted things on your beautiful mushrooms. Turn back to the veggies brush of the list. 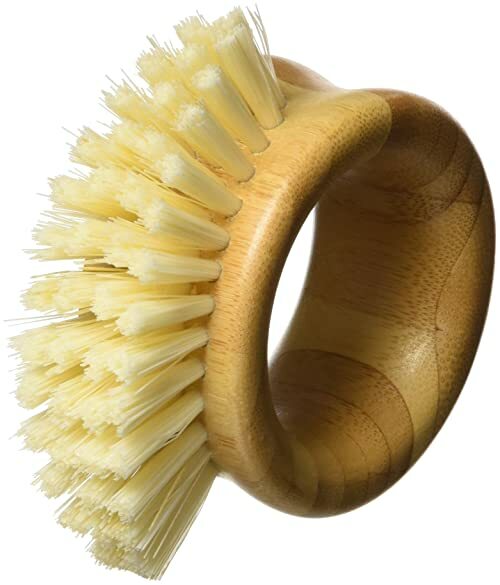 Here is the Full Circle the Ring Bamboo vegetable cleaning Brush whose outlook stands out from the rest of this list, that is its circular design. Well, I fall in love with this for the first time I see it because of its unusual design. Made of bamboo wood, a natural material for utensils, this is super safe and high qualified, deserved your money. What really differs this from others is the hook that this creates for the brush. You can find using this kind of model much simpler than the traditional one as well as the way you hold it also different and requires less force. In addition to that, the bristles are attached into the tool according to the shape so that they also nearly fit the total circle. The bristles are bended, allowing you to clean to even the hardest parts of your yams, potatoes, zucchinis and alike. Especially, the bristles are made of recycled plant fiber which is safe and friendly to the environment. After each time using you should at least wash it under water tap, adding some soapy water into may be a good option for making it clean. Before the next time use, you have to let it completely dry unless you want it to be quickly get broken. This set consists of two similar veggie scrubs so I will tell something about one tool only. Well this Veggie Scrub, Vegetable, Fruit and Herb Washer is not a grib one but a kind of bag that you can do many things with it. This tool is completely made of BPA free plastic that is totally safe to your food. With the color of green, although this may not bring the feeling of luxury but it matches with your kitchen easily. 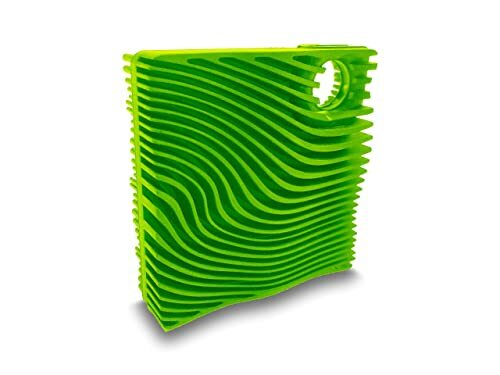 With the figures of 7” x 5.5” x 6.2”, this can hold a large amount of vegetables as well as fruits or even mushrooms and alike. Therefore, you can clean more and more food at one time. You can use this product in different ways as long as you like. 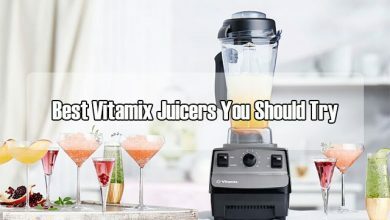 You can put your hand into it, wear like a mitt and then wash the carrots, the potatoes, … Or you place the vegetables such as the apples, tomatoes, herbs… into it and let the water wash away the dirt, and toxic things without doing harm with your foods, returning it to the former fresh condition. For example, you will find your sweet potatoes or mushroom much more yummy and delicious in somehow. 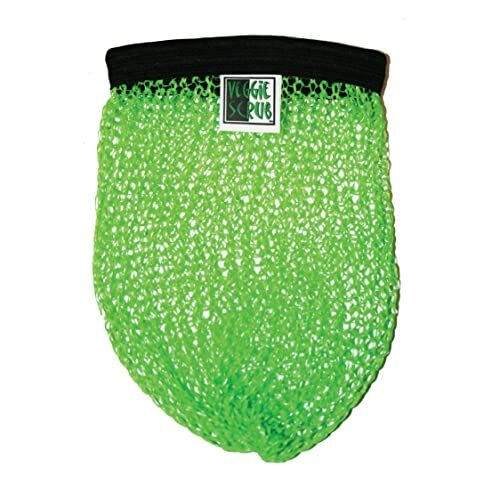 I think this is the easiest and quickest tool to be washed because it has the design of a cloth bag, thus you can squeeze it for drying and storing. Besides it can be reused for many times which saves you a lot of money and time. So, what are you waiting for? Final in this list is the Fushionbrands MushroomCloth Silicone Veggie Scrubber and Mushroom Cleaning Brush which will cater all kinds of taste even the hardest. Coming with two options for the color: green and black, which you can choose to match with your favor. Totally made of BPA-free, food safe silicone, this is proved to be secure to users so that you can feel alright even this is made of silicone. At the very corner, there is a hole for tying a knob to hang it somewhere in your kitchen for easy storage and the next time you use. One annoying point of this is that the size is quite small, making the cleaning sometimes unsmoothing, irritating many people. One of the most common questions that many people often ask me is all about how to well maintain the utensils in the kitchen. To me, keeping every piece of them for longer use and at the best condition is really important because you almost use it daily. And my tips are to keep the tools in a dry place and wash them after using except some special tools. By doing these, you can preserve them for long time. Thank you for reading all my effort from the top. I hope that after this review, you can gain yourself some knowledge about this topic and pick out one most worthy brush. And I also hope you can give some advice for others for their better information as well. 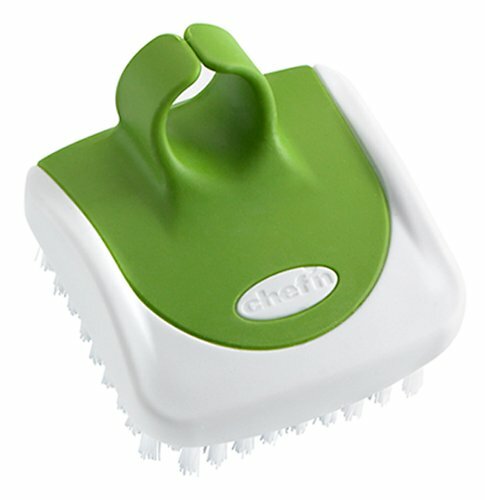 Finally, wish you the best veggie brush ever!